Only 6 left! 6 items in stock. The EVK75123 is the evaluation kit for the MLX75023 and MLX75123 Time-of-Flight (TOF) chipset. This new chipset enables real-time 3D imaging at full QVGA resolution with unsurpassed sunlight robustness. 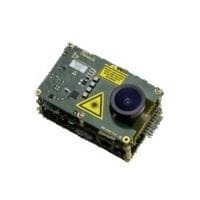 The evaluation kit is a complete camera built around this chipset and can be directly connected to a PC for visualization and recording of depth map data, while allowing direct access to many configuration settings. EVK75123 is a modular plug and play platform perfectly set up for customization by its customers. The kit consists of four stacked PCBs (from top to bottom: illumination board, TOF chipset board, interface board and a processor board). It is possible to detach the top two PCBs from the bottom two PCBs by bypassing the board to board connection with an external cable suitable for FPD-Link III communication. A graphical user interface for Windows is provided for live depth map visualization, basic recording, analysis and configuration. For custom SW development, a MATLAB SDK and C API is also provided. The built-in flexibility of the evaluation kit enables any designer to develop the necessary system know-how and experience for use in their application. This kit is the 110 deg field-of-view (FOV) variant.